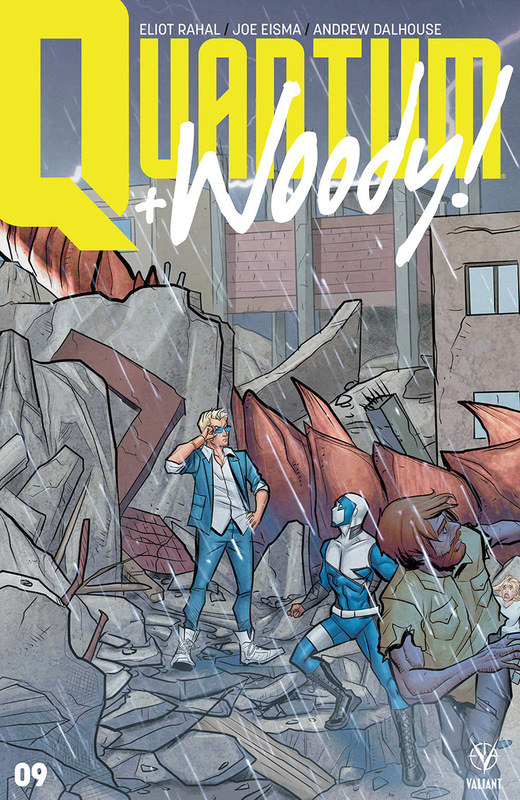 The world seems to be a different place for Quantum and Woody ever since they came back from another dimension. Quantum is married and Woody is in therapy. The world seems to be a different place for Quantum and Woody ever since they came back from another dimension. Quantum is married and Woody is in therapy. Their powers work when they are apart from each other but at least they still have their pet goat. Quantum and Woody #9 sets up not just a whole new reality but introduces a new villain for our unlikely heroes to fight. I’ll stop there because I don’t want to spoil anything. The writing in this book by Eliot Rahal is so clever. The situation that Quantum and Woody find themselves in could be straight out of a sitcom but it is written in such a way that you would never know. The thing that stands out most to me about the writing is the interaction between Quantum and Woody. These men have had their lives turned upside down and are closer than they were before their lives got messed up. There is a great bit where our heroes decide to meet up and get drunk and it lands on so many notes. Rahal is the perfect writer for this series. The art by Joe Eisma is really fun. It drives home the comedic situations in such a great way. There is a great panel after Woody saves his goat where he drops it at his therapists office and I could not stop laughing. I loved the way the panel was drawn. The new villain looks great and all of the elements surrounding the arrival of the villain are fantastic. The action scenes are a lot of fun and I could tell that Eisma was having a blast drawing this book. I couldn’t find anything wrong with this book. It was so much fun to read and I had a smile on my face the whole time.